Normally I'm not one for cultivars but I made an exception in this case. I've had Trout Lilies growing in the garden for almost 10 years now and they have yet to flower! 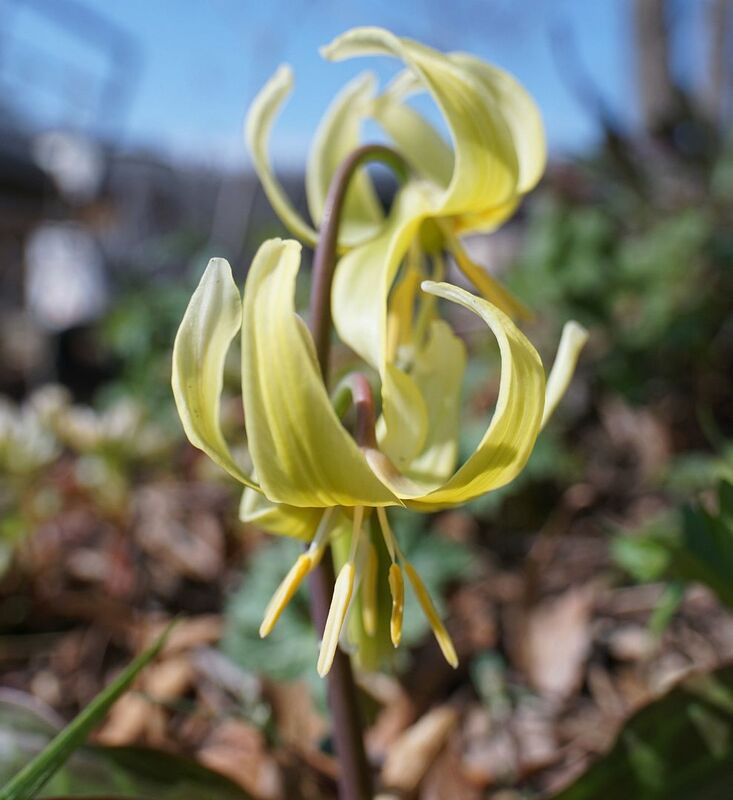 Erythronium americanum much prefers to clone itself under the soil sending up a small carpet of roots everywhere. I've ready that on average only 5% (of what might be considered individual plants) in a given population will flower. Blooming seems to be triggered by the tap root finally reaching a certain distance down, or perhaps because it's become stressed from hitting rocks and things. I've been told that they're more likely to flower if rocks are placed just under the bulb to help stress the plant into sending its energy elsewhere but have yet to try this. 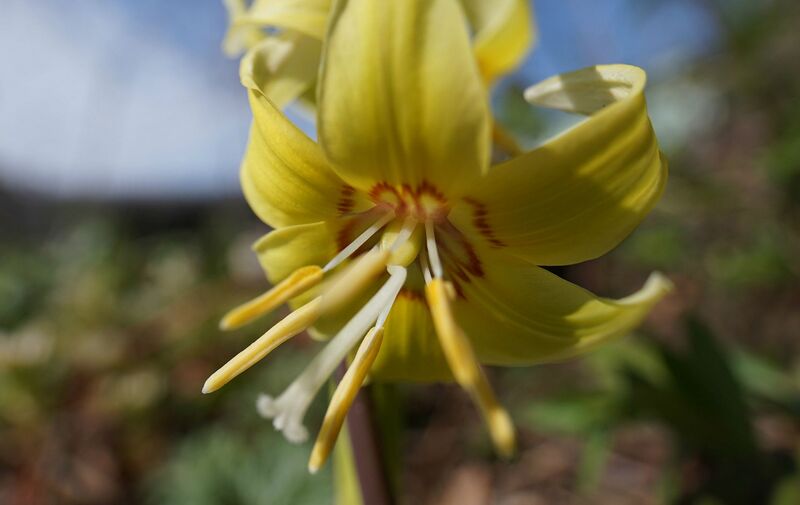 So I bought a cultivar called, Erythronium 'Pagoda' which is a hybrid of two species native to the western United States. I gather both are better about flowering and this hybrid cultivar seems to be no exception. It's parents are E. revolutum and E. tuolumnense. E. revolutum goes by Pink Fawn Lily, and seems to show through in the cultivar by the matting on the leaves. 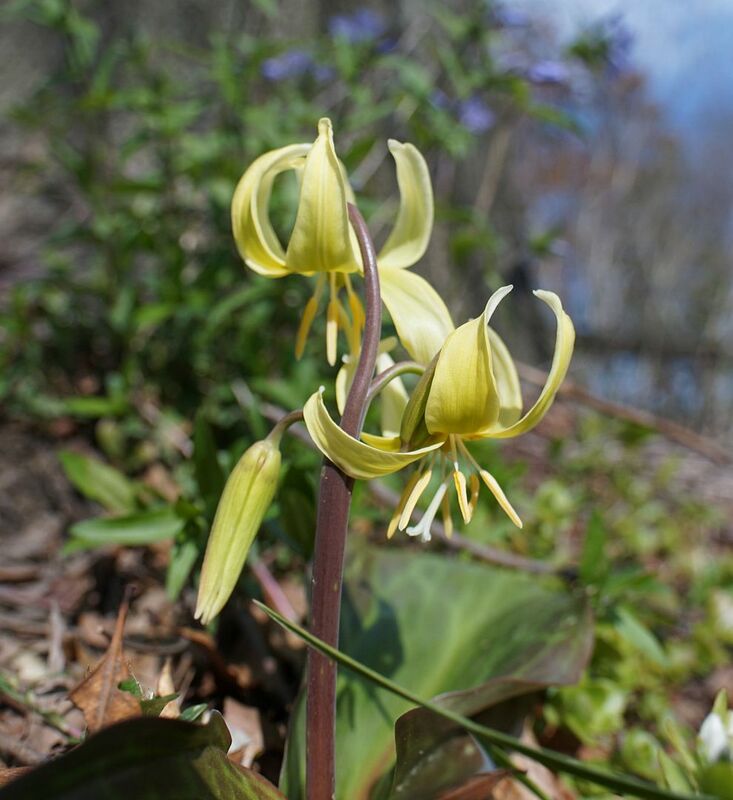 E. tuolumnense goes by Tuolumne's Fawn Lily, and seems to show through in the flower color (yellow). Of three plants I have, all of them have produced flowers, which all have multiple buds on a single stem, making this a superior plant to the more indigenous native in a garden setting at least. After a decade I expend at least one of them to flower, and thus far the best I've gotten is one to produce two leaves, meaning that it's thinking about flowering, so maybe next year. For now though I'm enjoying these. Trout Lilies all seem to spread their seeds about by ants, which is what got me interested in growing so many wildflowers in the first place. I'm eager to see if this cultivar does the same. And perhaps if the seeds are viable, see whether the diversity of the two species are still there. I may end up with a pink flowering one in a few years or maybe ones which lack matting on the leaves. Normally hybrids are sterile though, so it's likely this one is only maintained by division. Still though it will be interesting to see what happens.